GET YOUR KIDS TO EAT MORE FRUIT! 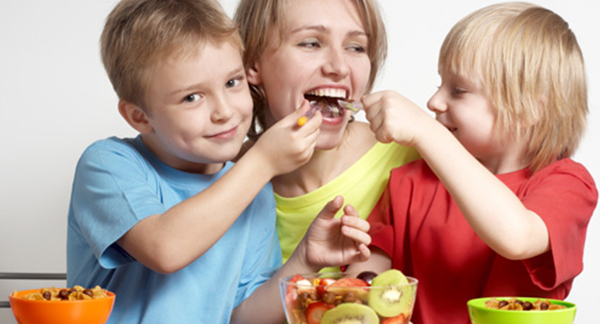 Dental care for children includes a healthy diet. All of your dentist’s good work can be undone by too many lollies and sweets. We all love sweets and lollies and sometimes that craving is irresistible! But we know that sugary foods like lollies, cakes and biscuits are particularly bad for our teeth. The most effective way is to keep sweets and lollies out of the house altogether, because if they aren’t there, you can’t eat them. So keep them to a minimum and try not to let your kids know they’re around. If they know lollies are in the house they’ll ask for them. Here are a few healthy alternatives, but don’t be tempted to go overboard. Even healthy treats should be eaten in moderation! It’s safe and fun to let even little children prepare some fruit; watermelon flesh can be chopped with a plastic knife, grapes can be popped off the bunch. Chop fruit into small pieces for little hands. Chop fruit into cubes and let your child build while they eat. Consider buying a “spiralizer” – kids of all ages adore these fruit and veggie curls. Freeze fruit like grapes, mandarin segments and chunks of mango. You can push a paddle pop stick into larger pieces like pineapple or banana. Serve a small dish of yoghurt with dipping fruit – strawberries, slices of apple or pear. Let your child help make fruity ice-blocks. Puree blends of favourite fruits and pour into moulds and pop in a paddle pop stick. Make fruity kebabs – another kid friendly recipe. Don’t use sharp skewers, use paddle pop sticks for very little children, or chunky kebab sticks for older kids. A cup full of colourful frozen berries is as attractive as a bag of lollies. Make a fruit “pizza” using a slice of watermelon as the base and let your child decorate it with colourful fruit and a yoghurt “sauce”. Cut slices of fruit and then shape them with cookie cutters – hearts, stars and animals are popular. Don’t waste the leftovers, blend and freeze. Chop fruit and use pretzels to make animals and bugs. Use the pretzels for arms and legs, banana pieces for bodies and grapes for heads. Don’t be tempted to give your child too much dried fruit as a sweet alternative. Dried fruit is high in sugar and is very sticky – a very bad combination for kids’ teeth.And remember to let your kids help and to eat healthy snacks in moderation.Normanhurst Dental is a child friendly dentist and we’re happy to talk to you about your child’s dental health and hygiene. Call us on 9989 8565 to arrange a check up and for friendly advice.